SnugglePuppies™, with a new and improved heartbeat, will capture your pet’s heart! All ages of animals love our adorable SnugglePuppie™ because they connect with the “real feel” heart beat and gentle warmth. Remember that children and seniors love to cuddle them too! Heart beat with batteries and two types of heat included. We like Snuggle puppies at Manor Lake because they can make our Australian Labradoodle puppies more comfortable when they are transitioning to their new homes. The young puppies really like the heart beat and warmth of the SnugglePuppy, it reminds them of their litter mates and mother and comforts them through this separation. We carry the Snuggle Puppy in our Manor Lake Dog Boutique, check them out! Posted in Australian Labradoodles, Dog Friendly, Labradoodle Products, Links, Manor Lake, Manor Lake Customers | Comments Off on Snuggle Puppy! How adorable is this dog station? We came across this on Pinterest and had to share this adorable home setup that is an easy way to organize all your dog’s treats, bones, toys, and more! Posted in Australian Labradoodles, Dog Friendly, Labradoodle Products, Links, Manor Lake, Manor Lake Customers, Purchasing A Labradoodle | Comments Off on Manor Lake Puppy Pack! As we all know, leashes can be pretty expensive sometimes. If you’re looking for an inexpensive and fun craft for your canine companion, Modern Dog Magazine has a great tutorial! Happy Woof Wednesday! Colourful rope dog leads have been all the rage in the pet accessories world lately—and I am obsessed! But with prices ranging anywhere from $70 to over $150, they’re a little outside most people’s “dog stuff” budgets. If you’d still like to get your paws on a stylish leash for your pooch (in whatever colour your heart desires) without breaking the bank, give this easy DIY rope leash project a whirl! Many rope leads use traditional nautical splicing and whipping techniques, but today we’re going to employ a bit of a shortcut! (If you want to learn how to splice rope, there are tons of video tutorials on YouTube.) 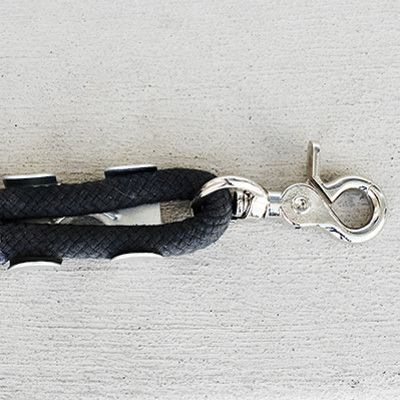 So, are you ready to make your own rope dog leash? Awesome. Pawesome. Here’s what you’ll need! STEP 1 Determine about how long you want your leash to be (anywhere from 4 – 6 feet is pretty standard) and cut it accordingly. Be sure to tape or tie off the ends so your rope doesn’t unravel. STEP 2 Soak your rope in some warm water. Meanwhile, prepare your dye according to the instructions on the bottle. You won’t need very much! A bottle of RIT Liquid Dye will go a long, long way. STEP 3 Now for the fun part! 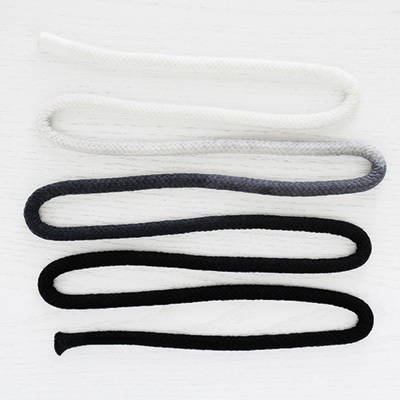 For an ombré/gradient/dip-dyed effect, quickly dip and remove your rope from the dye. Then re-dip at different heights/levels, until you’re happy with the gradation. Want your rope all one colour? 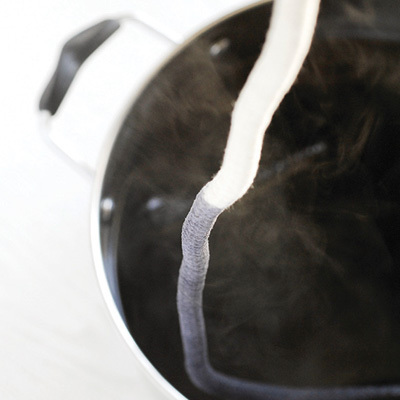 Submerge the whole rope in the dye, stirring constantly until the desired colour is reached. STEP 4 Remove your rope and hang it up (outside or in the garage), dark end at the top, to allow the dye to creep down the rope. You can help it along by squeezing the excess dye/water down the length of the rope. STEP 5 Once you’re happy with the way the gradient is looking, rinse the rope in cold water until the water runs clear or use some RIT Dye Fixative before you rinse out the rope if you want to super-seal the colour. STEP 6 Allow the rope to dry thoroughly. This may take up to 24 hours. STEP 7 Now that your rope is dry, it’s time to attach the clamps and snap hook. Decide which end you want to place the hook. Feed the end of the rope through the ring then fold the rope over, creating a small loop. STEP 8 Place the clamp on a flat surface with the prongs facing up. Lay the base of the rope loop inside the clamp, between the prongs. 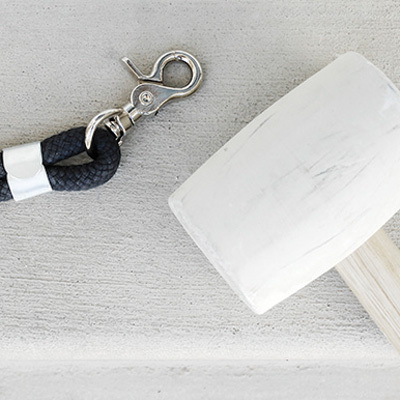 With a hammer or rubber mallet, hammer all four prongs securely over the rope. 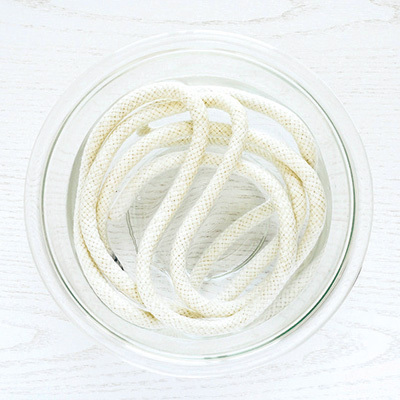 STEP 9 On the other end, fold the rope over to create a 6 – 7″ loop (bigger or smaller depending on how big your hands are and what feels comfortable to you). Then repeat step 8. Now, after you’ve attached the rope clamps, you could call it a day—you have a perfectly functional leash at this point. 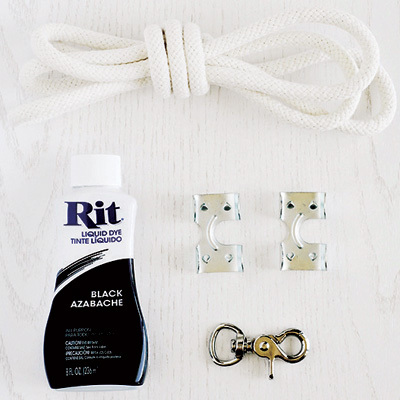 (Heck, you could skip the dyeing altogether and just attach the clamps and snap hook and—BAM—you’d have a leash.) If you really want to take this project into über-stylish territory though, you’ll want to add some finishing touches and cover those ugly clamps up! There are multiple ways to cover the clamps: you could wrap them in twine/yarn/string/ leather cording/etc. I chose to use some scrap leather and create a sleeve with some colourful stitching. If you’d like to do the same, get the how-to for the leather finishing here. Then sit back and await the compliments! Puppy Pack: This is basically a starter kit for your new puppy or dog. It comes with all of the items in this picture which includes all items that we use here at Manor Lake such as brushes, toys, treats, food and water dishes, shampoo, puppy pads, and more! Grooming Package: Our grooming package has everything you need to take care of your beautiful dog’s coat, ears, eyes, and more! It comes with shampoo, brushes, dematters, detangler, eye wipes, ear cleaner, and more! For information on either one of these packs, please e-mail us at kim@manorlakelabradoodles.com and we would be happy to answer any questions!